Wasatch Resource Recovery’s sister tanks fall nothing short of impressive. Each anaerobic digester is built to hold 2.5 million gallons of food waste, with the combined capacity to accept 1000 tons of food waste per day. 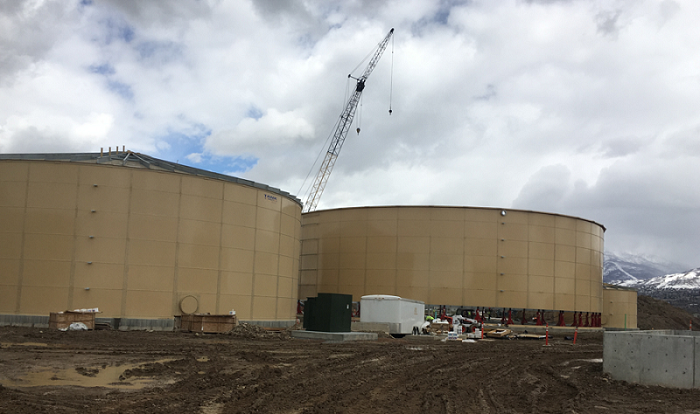 Once operational, the digesters will produce enough biogas to power 40,000 homes – a town equivalent to the size of Bountiful. The capture and prevention of these greenhouse gases from reaching the atmosphere can also be compared to taking 75,000 cars off the road. Structurally speaking, the tanks are not only impressive in size, but in their durability as well. The anaerobic digesters are expected to last for decades into the future, providing long term benefits to numerous communities along the Wasatch Front. While diverting waste from the landfill is an obvious perk, digesters also output several useful byproducts. Firstly, biogas captured during this process is a clean-burning renewable energy source that can be used to power homes and vehicles. Secondly, digestate can be used to produce bio-based fertilizer for use on local farms – providing a great alternative to chemical fertilizers that have the potential to pollute groundwater and soil. Finally, excess carbon can be used to grow algae; which can be dried and used as a bioplastic, to grow hydroponic crops, or even create energy. This system of recycling emulates the sustainable and cyclic natural systems we as humans rely on – and will stand as a hallmark of sustainability in Utah for years to come.